Six months ago, Pope Francis essentially dropped the microphone with his call for environmental justice, and now he's at it again. This time, the Vatican wanted to create a spectacle. So, it used 50 projectors to display the faces of endangered and extinct animals on the front of St. Peter's Basilica. The goal was to shine a spotlight on environmental issues like climate change that are facing the planet and its inhabitants. And to call on the world's leaders to do their part. 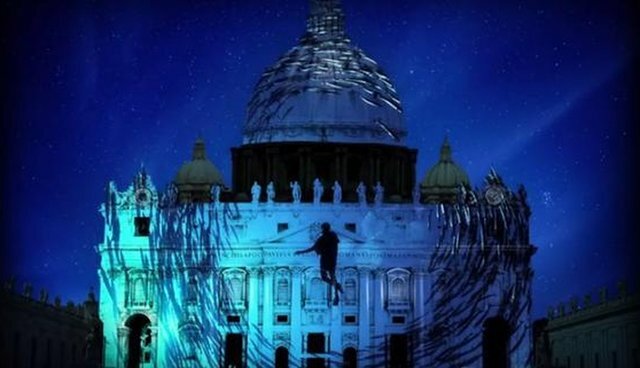 The Vatican teamed up with the makers of "Racing Extinction," who have brought their state-of-the-art projection system to iconic buildings around the world. Above, the team projects the image of a tiger onto the Empire State Building, a face for all of New York City to see. The Vatican's light display comes at a crucial moment - the closing week of the 2015 global climate talks in Paris, France. "Because of us, thousands of species will no longer give glory to God by their very existence nor convey their message to us," the pope wrote earlier this year. "We have no such right." "Everything is related, and we human beings are united as brothers and sisters on a wonderful pilgrimage, woven together by the love God has for each of his creatures." Below are several more photos of the earth's inhabitants, as beautifully projected by "Racing Extinction" and The Vatican.